Melasma is a common condition causing blotchy, brown discolouration of the skin on the face. It is commonly seen on the forehead, cheeks and to some degree on the upper lip and chin. It is more common in women and in people with darker skin types. Often there is an inherited predisposition to the problem. It is often a persistent and an embarrassing skin condition. 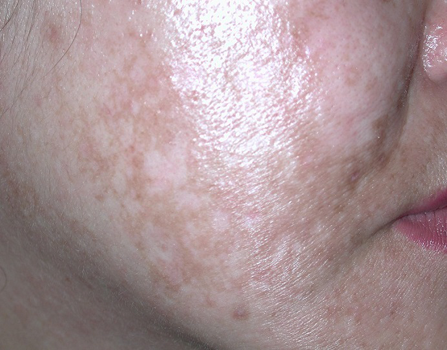 Occasionally, melasma may look like other skin conditions and the diagnosis may be less clear. In these instances, your dermatologist may take a biopsy (a small sample) from the skin to confirm the diagnosis. What treatments are available for melasma? Sometimes, melasma will fade away or lighten without treatment. A strict regime of protecting the skin from the sun with the use of high protection, broad-spectrum sunscreens and broad-rimmed hats, and modifying activities to minimise sunlight exposure daily can help and should be the first step in trying to treat melasma. Wearing high-protection sunscreens daily, even when indoors, is an essential part of treating melasma. Hydroquinone – hydroquinone is a common first-line treatment for lightening pigmented skin. Some creams and lotions containing hydroquinone are available over-the-counter from pharmacies. Sometimes your dermatologist may prescribe a higher strength hydroquinone based product tailored for an individual patient. Chemical peels – alpha-hydroxyacids such as glycolic acid in the form of creams of chemical peels can also be helpful. Care is required to prevent excessive irritation, which can worsen melasma. Often a series of low-strength chemical peels are performed to gently remove pigmentation from the skin. Lasers – while laser treatment is certainly appropriate for treating melasma in some cases, it should not be the first-line treatment for melasma and must be used with extreme caution to prevent post-inflammatory pigmentation (a troublesome darkening of the skin). In certain cases, usually when other treatments have not been successful, laser treatment can be considered using fractional lasers. What is expected after melasma treatment? The successful treatment of melasma takes considerable time. It is important to remember that this is a difficult condition to treat and further darkening of the skin can occur easily due to sunlight and hormonal factors. After melasma is treated, avoiding further triggers is essential. Even the smallest amount of sunlight can cause a significant setback to successful melasma treatment. Always wear an SPF 50+ sunscreen during the day, even if not outdoors for significant time. Your dermatologist will recommend an ongoing maintenance plan for you to minimise the chance of melasma recurring.